This grid lace scarf combines several basic stitches to create a lacy grid pattern that's pretty but simple to crochet. It's easy enough for beginners who have mastered the chain stitch, single crochet, and double crochet. Be aware that the stitches on this scarf lean slightly to one side. That's just the nature of this stitch pattern. 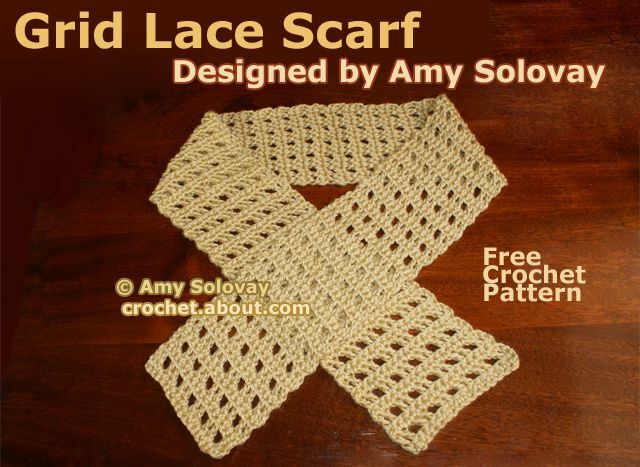 If you'd like less lean, try the non-leaning grid lace scarf pattern. It's a bit heavier and slightly less lacy. There is also a two-color version if you'd like to crochet it in the holiday, school, or team colors. Medium Weight Yarn: I crocheted the sample scarf using about 3 ounces / 86 grams of Caron's Simply Soft yarn in the "Autumn Maize" color. Feel free to substitute any similar yarn if you like. Row 1: sc in 2nd ch from hook and in ea st across the row. Row 2: Ch 3, turn. skip the first st because your ch 3 will count as the first dc in this row and throughout the rest of the pattern. dc in next sc. [ch 1, skip next sc, work 1 dc in ea of the next 2 sc.] Rep the sequence in brackets across the row. Row 3: Ch 1, turn. Work this entire row in sc as follows: sc in 1st dc, sc in next dc, [sc in next ch-1 sp, sc in ea of the next 2 dc.] Rep sequence in brackets across the row. Continue repeating these two rows, alternating them, until your scarf is the length you want it to be. End off, leaving enough yarn for you to weave in your ends. Thread your tapestry needle with this end of yarn and weave it into the scarf. Do the same for the other loose end(s). If you crocheted your scarf using wool or any fiber that responds well to blocking, you'll want to block it to accentuate the beauty of the lace pattern. Not all yarns respond well to blocking.